The holidays are fast approaching, a time when people start freaking out about what gifts to give hard-to-buy-for family members. Money flows. For many retailers, it’s a time to make or break; for many individuals, it’s a stressful and anxious time. I wanted to share how my family has been fighting this trend, and what we’re thinking about doing differently this year. Many years ago, my parents started doing a Christmas donation give-away. They would allocate a certain dollar amount to each family member, and give us Monopoly money to represent it. Then we would all go through the charity giving catalogs and decide where we wanted to put our giving dollars. Sometimes we teamed up to do something like help pay for a well (which are often expensive), or sometimes just spend it on something like vaccines for kids or bicycles for girls. Similarly, in years past, Ian and I have given donations in the name of family or friends, and then provided them a handmade card to let them know what we did in their name. But usually, in both cases, the donation has supplemented gift-giving, or accompanied an actual physical gift. This year, I think we’re going to do it differently. With the election, and with the precedent set by the officials so far appointed in the new administration, it’s going to be extra-important to support causes and people that will be hurt in the future. That’s why, this year, we’re starting to talk about doubling down on this commitment to donations at Christmas. We’re talking about going all in and, with the exception of gifts for Benji, forgoing gifts entirely. Instead, our entire gift budget will go to charity. Gifts are supposed to remind us of the gift God gave to us at Christmastime: Jesus, and, through him, grace and redemption from our sins. Getting even a very appropriate gift that I like and appreciate is nice, but I believe that giving to nonprofits and charities that do Jesus’ work* is even more in keeping with the intention of Christmas giving. I’m going to be asking my friends what charities they would like us to support in their name (feel free to let me know in the comments or by email as you read this, if you want! ), and I’m going to be researching organizations that I want to give to this year. It’s going to be more than just sending Bibles to Africa, believe me. This election, and the national mood to go along with it, has really reminded me why we need to live generously. It’s not just people “out there” who need our help; it’s people right here, in our state, county, city, neighborhood. Many people have been hurting for a long time, and they chose Trump because they’re hoping to get some kind of help. Well, I doubt Trump is going to help them, but I’m pretty sure nonprofits will be there. Probably, we should have been living with this level of generosity all the time. I guess it takes a serious jump to get our engines going, but this is about as big of a jolt as we could hope for. Time to take a leaf out of Jesus’ book. He gave everything, even his life. We can certainly allocate a few more dollars to help others. *That’s not to say that we’re only going to support Christian charities; I know many excellent organizations that aren’t explicitly Christian do the kind of work Jesus would absolutely support. Perhaps unsurprisingly, I’ve been thinking about Christmas presents lately. Not what to get my family (although, of course, I’ve done that, too), but more the philosophy and theory of gift-giving, specifically: Why do we give gifts at all? Now, birthday gift-giving seems somewhat logical, with friends giving the birthday-ee gifts to express their appreciation for the friend’s life. Perhaps we’re using presents to say, “You are a gift in my life. Let me give back to you a token to acknowledge all the joy you bring to me by being my friend.” That completely makes sense, although since having Benji I’ve thought that moms should really get the presents on the kid’s birthday, but that a different story. Christmas gifts, now. There are two perspectives one could take: Christian and non-Christian. The Christian reason I can see pretty easily: God gave us Jesus, and Jesus gave his life, the ultimate sacrifice to give us the free gift of a redeemed life in Him. As Christians, we then would give one another presents to remind ourselves of that truth. However, if that were the only reason to give gifts, presumably we would simply give one another cards, or some symbolic token, like the bread and wine in Communion. But we still give one another real presents, and often agonize over what to give, too. This leads us to the same place as non-Christians giving presents: Why? Why do we put so much time, effort, and money into one single day of giving presents? More, what I really want to know is, why do we agonize so much over finding the perfect gift for loved ones? The pressure to find many different people a unique, thoughtful, meaningful present can turn the holiday into a month or two of horror. Is this some kind of evolutionary adaptation? Do we have an innate desire to find just the right thing in some evolutionary dive to keep our tribe happy, thereby keeping it together, keeping the individuals safer, and making it more likely to propagate our genes to the next generation? That seems a stretch, especially given the failure rate (how many times have you gotten something not right for you?) and the fact that we often give gifts to people who provide no evolutionary advantage, like old relatives or friends far away. So, then, is this gift-giving mostly driven by marketing pressure, businesses spending months braying about finding the “perfect present for someone who already has it all,” leading inevitably to the unfulfillable expectation that we will find perfect gifts for everyone we know? This makes me think there’s a happy medium we’ve been missing here. Clearly we value tangible physical objects (or their emotional equivalent), and want to give something real and appropriate to our loved ones at Christmas. And, despite what all the previous discussion may have led you to think, I’m all on board with giving presents in general. I don’t want it to sound like I think we should just toss out the entire tradition. I just feel that maybe it’s time to reassess our assumptions and expectations about what an appropriate gift looks like. Christ never cared for stuff, and I can’t believe that He would like our current obsession with giving things at Christmas. He said it was harder to be a wealthy believer, because our possessions really possess us, distracting us from the point of life – loving other people. I think I’m going to try this next year, so if you get a heartfelt note from me in lieu of the perfect thing, you’ll know why. I would love to receive those kinds of gifts, too, so feel free to test this theory out on me. And, if I don’t get to it between now and next week: Merry Christmas! * Note: There seems to be an implied but not universal assumption that we should/do spend more money on people we love more, and therefore you can gauge how much the giver loves you by how much they spent. Again, clearly not true – a homemade gift may be far more loving and heartfelt than an expensive one; plus, many people don’t have the resources to put into that kind of giving – but still this idea does linger, presumably also driven by money-grubbing advertising. Mom and Benji and I went Christmas tree hunting today. It was certainly different from cutting a tree in the woods, but one thing was the same: I somehow managed to get extremely muddy and dirty despite the suburbanity of our acquition location. 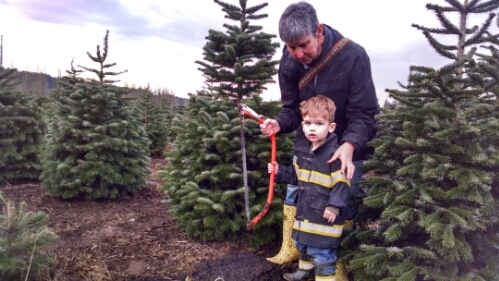 Anyway, here are mom and Benji before cutting the tree. 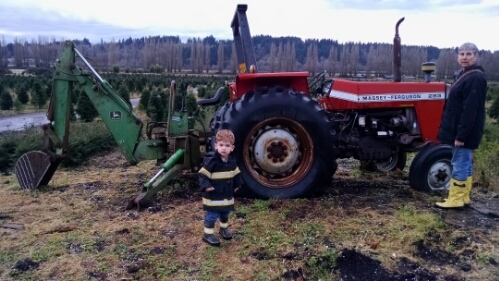 Let’s be honest, though: Benji really cared most about the tractor/backhoe combo truck, and the tractor. You know how mattress ads sometimes have allusions to the cloud-like qualities of their products? Well, we can do one better: For Christmas, Grammy Deborah actually made Benji a cloud toy. 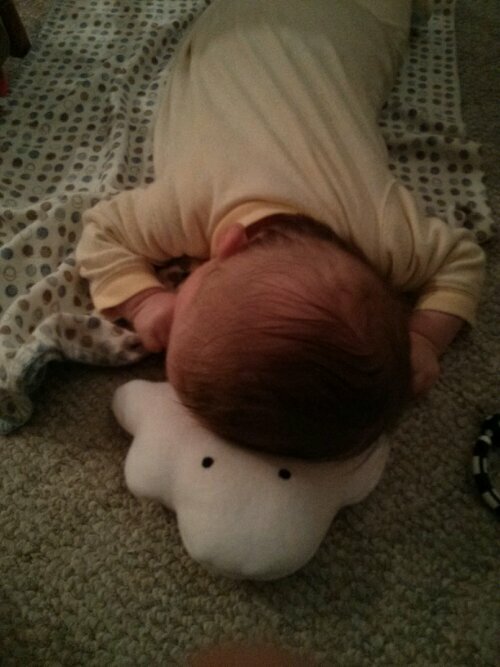 In this picture he looks asleep but is really resting his head during tummy time. Although he still hasn’t figured out rolling over, tummy time is going well, and now that he can hold his head up enough to look around, he fusses far less than previously. Also in the neck-strength department, he’s getting the hang of the jumper seat we recently obtained. He sort of slumps forward in it (balance isn’t a forte at this point) and when he gets tired he leans his head on the straps. But he has started figuring out that straightening his legs has an effect – whoa, those lower appendages may be there for more than just random flailing! Crazy! He’s such a happy baby that it’s a joy to play with him. Reading is especially great, with him trying to eat the book but also looking intently at the pages with great interest and patience. It’s pretty easy to induce his grandparents to watch him. 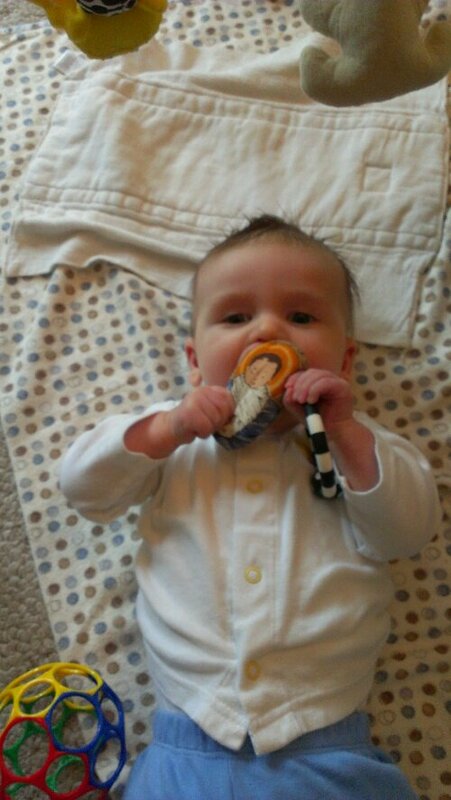 …if you can’t try to eat the Baby Jesus? I ask you. Ian and I woke up happy, looking forward to the day. 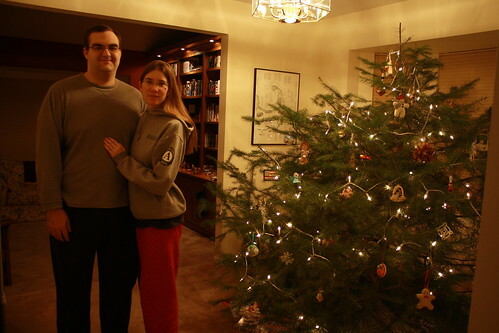 We took this picture in front of our first Christmas tree (which we’ve dubbed the Christmas bush). We gave each other presents. I prepared some dinner rolls for the evening. We loaded up the car with gifts and defrosted berries and decamped for Mom and Dad’s house, where Colleen made crepes, which we topped with the berries, yogurt, and powdered sugar. We exchanged gifts (Colleen and Jordan gave me an enormous cookbook of just cookie recipes — I can hardly wait to get started). We gave away a lot of Mom and Dad’s money to charity (water-related charities benefited greatly this year). 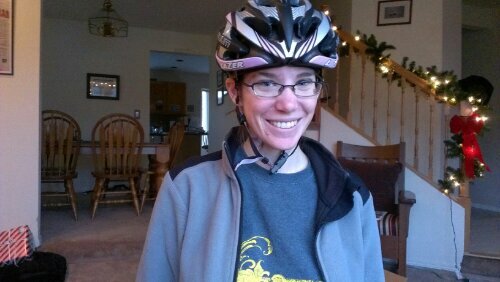 Then Dad and I went for a bike ride while Ian stayed home and made scalloped potatoes. Our families were coming over to our house for Christmas dinner, the first-ever Christmas we’ve hosted. The entire tone of the day changed when I arrived home from my bike ride. Ian was in the kitchen making miserable noises and desperately working on the potatoes. 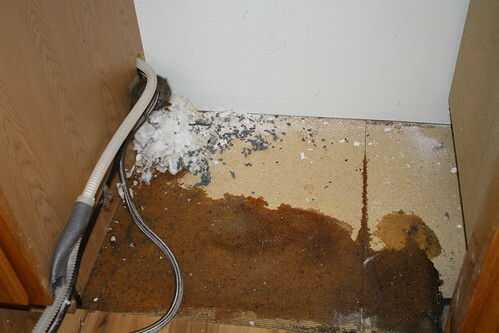 Turns out, the source of Ian’s distress wasn’t so much the potatoes as the fact that he discovered why the flooring in our kitchen was starting to peel up around the edges: Water. In the subfloor. Not under the sink, but coming from the dishwasher. When you stepped on the floor, it squished like mud. This all came to light about an hour before our families were supposed to arrive. The house still needed all manner of prepping, and we couldn’t do anything about the dishwasher immediately aside from not running it, so we rushed around getting ready for dinner. We’ve never tried to entertain nine people before; this brought to light the fact that our silverware came in a set of eight, and we have no more than 4 of each set of matching napkins. Also we only have the one oven, which is a real limiting factor. Then people and food started arriving (the Fergusons showed up earlier so we could do Christmas present exchanging with them — Deborah is going to help me with our back yard, and Gary’s going to help me fix our leaky toilet, both fabulous gifts), and it felt like the next thing I knew, every surface in the kitchen had food on it. Dinner went pretty darn well, considering we had to wash everything by hand. Even with nine people, we hardly made a dent in everything. Mom’s 18-lb turkey hardly looked touched; same for the spinach salad and its toppings. In fact, the only thing that did look touched was dessert: Happy Birthday, Jesus! Birthday Cake (actually chocolate cherry jubilee cake, which we only make on Christmas; before cutting it, we sing “Happy Birthday” to Jesus) with vanilla ice cream and a pumpkin pie with whipped cream. Everybody made good inroads on those. Between dinner and dessert and for a bit after dessert we played Apples to Apples while we took turns doing dishes and Gary finished carving the turkey. Mom pulled me aside briefly and pointed to the toilet in our downstairs bathroom. The tank was sweating copiously, with water running down the sides and pooling on the floor. She’d put down a towel, but it was wet, wet, wet. The toilet itself wasn’t leaking; the water was just so cold and we had so much moisture in the air from all the cooking that it kept condensing and running down. We left the towel there for the time being, there being not a lot else to do. At this point — finding a rat nest with dead rats inside behind our leaking dishwasher while standing on the peeling-up, soggy kitchen floor, with Mom having also just pointed out the water underneath the toilet in our downstairs bathroom — I think I went a little crazy. Fortunately, Gary and Ian extracted the rats and their nest and threw them in the garbage. Everybody packed up their food and headed off. We dug out our box fan and started blowing air on the kitchen floor. Then we went to bed, exhausted. I can hardly believe it was really all just one day from getting up and giving Ian his gifts all the way to finding dead rats behind our leaky dishwasher. This will certainly be a Christmas that goes down in family lore. The Year of the Rat. Author KatiePosted on December 26, 2010 December 26, 2010 Categories Food, LifeTags Christmas, leaky dishwasher, rats, water1 Comment on Merry Christmaaaaauuuuggghhh!!! Christmas on Saturday puts churches in a strange position: Church the day before Christmas and the day after Christmas? No church the day after Christmas? Our church made a call and they aren’t having church next Friday or next Sunday. Instead, last night at 5:00 Journey Church had its Christmas service. Last year we attended the Christmas service, but it was only Ian’s first time at the church ever. This year, we’ve both been volunteering at church for a while — Ian doing media stuff and me doing coffee; we’re playing out gender roles oh-so-nicely — so we helped with the service last night. Turns out they had everybody arrive at Kirkland Jr. High at 1:30 pm, and the place turned into a hive of activity for the next three hours. Two other ladies and I spent most of that time putting snack foods onto plates in pretty arrangements. Ian spent that time getting to play with the bank of stage lights the church rented. I’m thinking about switching what I help with. Upside Down (Christmas Eve) from Crosspoint Church on Vimeo. And then they had a reception-type thing after the service. That’s when all those bits of food came into play. Five people took trays and circulated them through the crowd, coming back every so often for refills. People ate…pretty much everything. My personal favorite food of the night: The homemade mozzarella and bacon pizza. Yum. Those little brownie bites from Costco came in a close second, though. Cleanup was pretty easy for my team, and by about 7:00 I was ready to go. I’d ridden my bike there, as Ian had a meeting earlier, so I rode my bike home again. It was dry but fairly windy, a pretty OK night ride, actually… If only I hadn’t had so many bacon pizza bites. 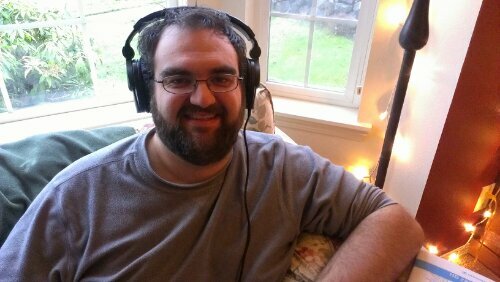 This morning I was supposed to meet up with my counterpart, Sander, from Feet First and go to Bonney Lake to do more bike audits around four schools. Yesterday, however, I checked the weather and saw to my dismay a 90% chance of rain. I called Sander and we formulated a plan that has resulted in our canceling the trip to Bonney Lake today. I’m happy about this. The deadline for the bike audit report isn’t until the end of January, and I’d like to spend this week with family and friends rather than on Bike Alliance stuff. Maybe next week, if any day looks sunny and reasonably warm, I’ll stir my stumps and make the trek to Bonney Lake. In the meantime, I plan on finishing Christmas shopping (this year somehow it’s snuck up on me, and I’m woefully unprepared), wrapping Christmas presents, and playing.